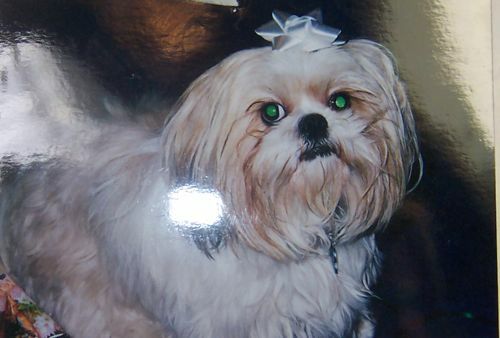 This is my female Shih Tzu, Bishi. Earlier in this blog, I have a line drawing of Bishi and Pango (male). They are such gentle, loving dogs, I don’t know why I haven’t painted them more. They are gold and white, so the next painting will have to be in color. This is 4-1/2 X 6 in my sketchbook, using my usual flair with water wash. This is the photo I used for the sketch. I see in the photo that her head was tilted more and I like that. I learn a lot from my rushing the drawings and making mistakes….or rather not making the best choices! Now, I’ll definitely mark the tilt before drawing next time. This entry was posted on Sunday, September 13th, 2009 at 5:53 pm	and is filed under Animals, Black and White, dogs, pen & ink, pets, Sketches. You can follow any responses to this entry through the RSS 2.0 feed. You can leave a response, or trackback from your own site. Great job! Excellent likeness. I think you have the “triangle of eyes and nose down pat! Giving her a head tilt might make her look a little happier. And if she is not looking directly at the viewer you might be able to capture the questioning look she has in her picture. 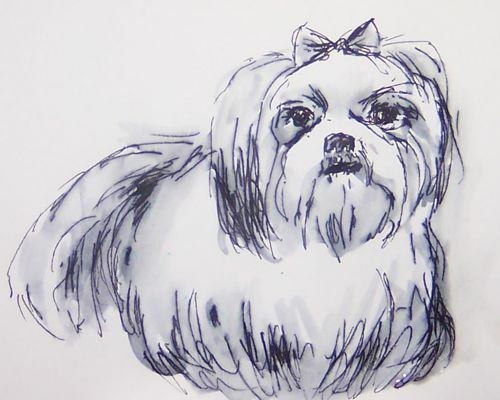 I bet it is really hard to do a line drawing of a pale colored dog. the likeness is quite sharp. I look at the image and totally see her, even before viewing the photo… good stuff!